"It would be difficult, anywhere in Scotland, to point out finer examples of what may be called open river scenery than those which are presented in the vale of Tummel. The Fall upon this river had been long an objecct of attraction, and nothing can well be imagined more graceful than the form which the water assumes in its descent. 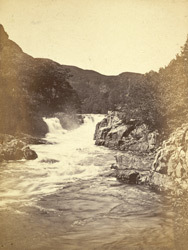 As the Tummel is here a wide and deep river, the mass of water is very considerable, and descends from a height of 16 feet in a snow-white sheet of vast breadth, and with a noise truly appalling. To the north-west of the falls is a cave in the face of a stupendous rock, where a party of the Macgregors were surprised during their proscription; part of them were killed, and the remnant having climbed a tree, were precipitated into the river by the cutting down of their retreat."